Music, dance, food, spinning, weaving, basket and snowshoe making are just a few of the Treasures of the Valley featured in this film. Acadian Festival showcases many talented performers from local musicians like Lionel Doucette and Verna Cyr, the LeBlanc Family Singers and the Ricky-Dean & Ray Trios to international acts such as Barachois, Josee Vachon and Jean Paul Poulin. 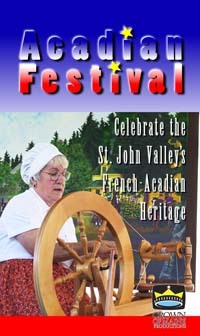 Few cultures know how to have as much fun as the French and when it comes to observing their Acadian heritage, the folks from the St John Valley really know how to celebrate. Shown on Maine Public Broadcasting Network October of 2009.